Inspiration can come from many places. There’s a deli near where I sometimes work and I’ll order something for lunch once in a while … matzo ball soup or a pastrami sandwich. It’s the kind of place where you order in one spot then walk way to the over side of the restaurant to pay and wait for your food. It’s the kind of place with the spinning display case full of enormous layer cakes and 5 pound slabs of cheesecake. It’s the kind of place where the counters are full of platters and baskets of sweet snacks … butter cookies with 57 variations of colored sprinkles and more traditional things like mandel bread and giant wedges of halvah. There’s also a basket of overly decorated rice krispie treats, cut into large squares and decorated with candies or chocolate squiggles. 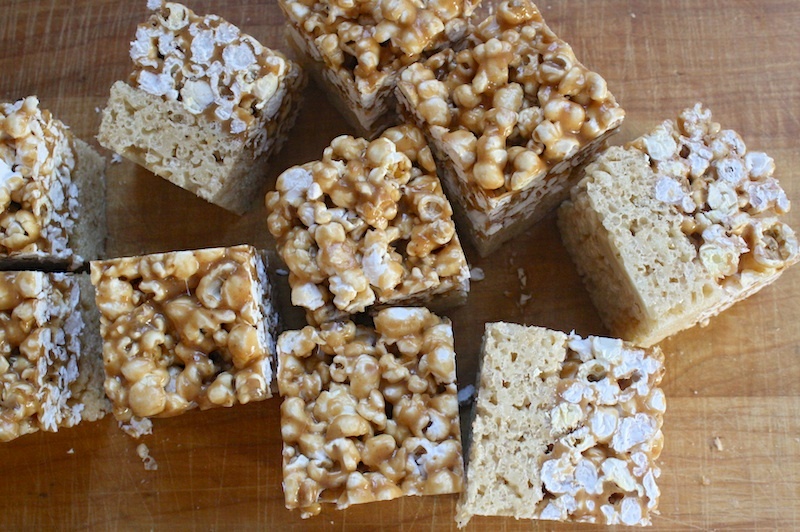 I’m always drawn to that basket and to one in particular: a layer of rice krispies topped with a layer of caramel corn. It looked delicious and I liked the idea – two classic childhood favorites sandwiched together. But the price always threw me – 6 bucks. 6 bucks! This is no single origin chocolate confection hand harvested and crafted by delicate hands. We’re talking cereal, popcorn and sugar. Delis can be expensive but I’ve never been eager to add that to my $12 sandwich bill. So I walked on, until one rather challenging day. I needed that damn rice krispie treat, 6 bucks or not. Into the bag it went without much thought. But deep down, I knew. I just knew that I should have kept walking. It was terrible – stale, flavorless, blah. The texture was off, the flavor was off; it really pissed me off. Such a disappointment. I was annoyed that my usually good judgement didn’t prevail that day. But the idea stuck. I knew it could be done better. And so one day, I did. 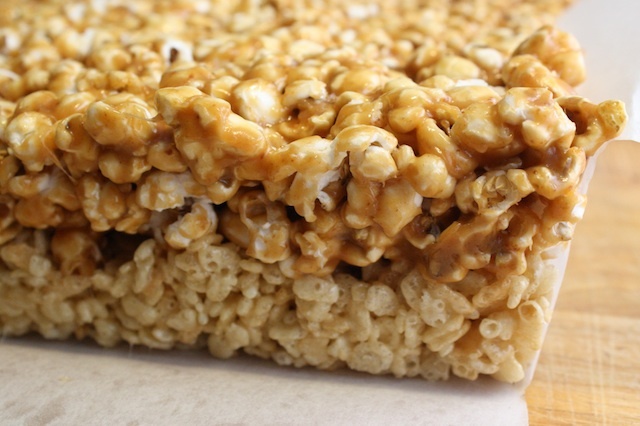 A layer of marshmallow-y rice krispie treat, just like when you were a kid. On top of that goes a buttery sweet crunchy layer of caramel corn. And it’s mighty delicious. I worked my way through several pieces in quick order, embarrassingly quick order. I originally wanted to make these for Halloween but that came and went before I knew it. So now I’m proposing this as the perfect Super Bowl snack. They’re perfect – hand-held, can be made ahead and they’re a good thing to sit on the couch and absently nibble between screaming at the defense. One very important thing that I cannot emphasize enough, is to make sure to really pick through the popcorn. You want big fluffy fully popped kernels. No grannies or hard half popped bits. They’ll kill your teeth. That being said you also need a good set of choppers. This is not the thing to serve at your Grandma’s retirement home party. Update 5 minutes after I hit “publish”: I just learned from Twitter that today is National Popcorn Day. Go figure! I didn’t even know so here’s a post to celebrate this momentous occasion. STRESS THERAPY BAKING FACTOR: This is a good one – fairly easy but with enough of a project feel to lend a good sense of accomplishment. There’s something nostalgic and fun about giving childhood favorites a hip new spin. I brought these to a BBQ and one guest turned to me and said “These make me very very happy.” That really put a smile on my face. Line a 9”x13” pan with parchment and lightly spray with nonstick cooking spray; set aside. For the rice krispie treats: Place rice krispies in a large bowl and set aside. In a saucepan over medium heat, melt the butter then add marshmallows, and salt; stir until smooth. Add the vanilla, stirring to incorporate. Working quickly, add the marshmallow mixture to cereal and stir to combine. Pour the mixture into prepared pan, pressing gently with greased hands to lightly compact. Don’t press down too tightly. Set aside while you make the caramel corn. For the caramel corn: Place the popcorn in a large bowl and set aside. Make sure you have only fluffy popped kernels. The best way to do this is to place the popcorn in one bowl and carefully transfer the popped corn to a larger bowl, discarding the unpopped and half popped kernels. In a large saucepan over medium high heat, combine the butter, brown sugar, corn syrup and salt; bring to a boil. Reduce the heat to medium and add the sweetened condensed milk. Stir constantly with a heat-resistant rubber spatula for about 4-5 minutes until the lower range of firm ball, 240°F-245°F. Pour caramel mixture over popcorn and quickly stir until coated. Moving quickly, pour the caramel corn over the pan of rice krispies and with greased hands press gently to lightly compact. Careful as the mixture will be hot – the easiest way to do this is to evenly distribute the caramel corn with a spatula, then place a piece of parchment on top and gently press to lightly and evenly compact the mixture. Let the pan sit for at least one hour. Turn the mixture out of the pan, using the parchment overhang if needed. Gently peel the paper off and discard. With a sharp clean chef knife, cut the block into nice even squares. Tip: if you’re having sticking problems, spray the knife lightly with cooking spray for cleaner cuts. Store tightly wrapped up to 5 days. I like to individually wrap each piece in plastic wrap for an easy grab and go type of thing. A Rice Crispy Treat at the ballpark is $6. I’m going to bring my own per your recipe! I want these so badly! 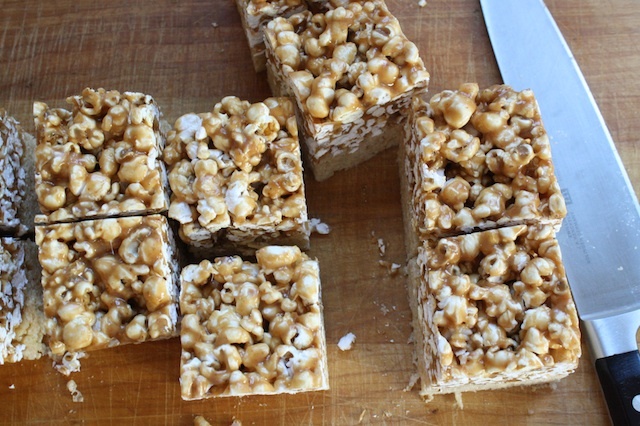 I am on a serious Rice Krispies treat kick, and I love caramel corn. This may be the best version of Rice Krispies Treats I’ve ever seen! We’re celebrating nostalgic childhood favorite recipes this month on the Shine Supper Club and this recipe would make an awesome contribution. Hope you’ll join us!